Today, looking back at all my old stories and poems, I got to thinking about how much I've changed. Not only as a writer, but as a person as well. 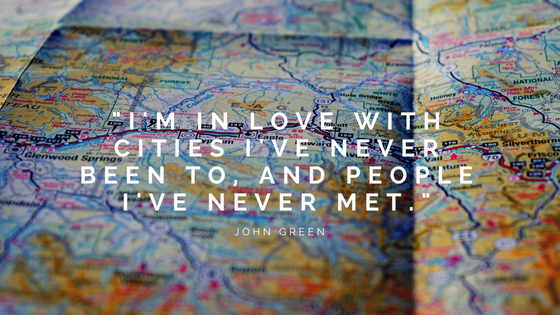 And I guess the reason I really started thinking about this journey so much is because of John Green. "I believe that what we map changes the life we lead…that while maps don't show you where you will go in your life, they show you where you might go." And this really stuck with me, because I look at these different stories and I see how they've mapped my life as a writer, and a person who wasn't always very happy. I think I can honestly say that I am happy with how my life has turned out now. I'm happy with the person I've become, with the things I've accomplished, and with this thing that fills me up every day with the need to write. That is what makes me happy, and I love it. I think part of this thing, whatever it may be, has something to do with the characters who inhabit not only the Falling series, but my head, my heart, and my life. Though they comes from cities I'll never see, though they, as John Green puts it, "are people I've never met," they still feel real, and I love them for that. I love the people I know they are and the people I know they will be when this series ends. There is something so beautiful and poetic about creating people, who eventually create you. And that's what these characters have done. They have created me into this writer I always dreamed of being. They saved me. Their words and their stories saved me. And when people bring you back to life, there's only one thing to call them. And that's why they're my saviors.